Attendees of the AIA 2016 convention, the premier architecture and design event of the year put on by The American Institute of Architects, experienced the latest VR with dramatic 4d effects. View, manufactures View Dynamic Glass, a new generation of architectural glass that intelligently transitions through multiple tint states to control the sun’s energy, providing an enhanced occupant experience and optimum natural light and thermal comfort. According to our lead tracking, VR ranks #2 in our reasons for a follow-up meeting/call. #1 is that people were actively looking for our product. That’s big for us. 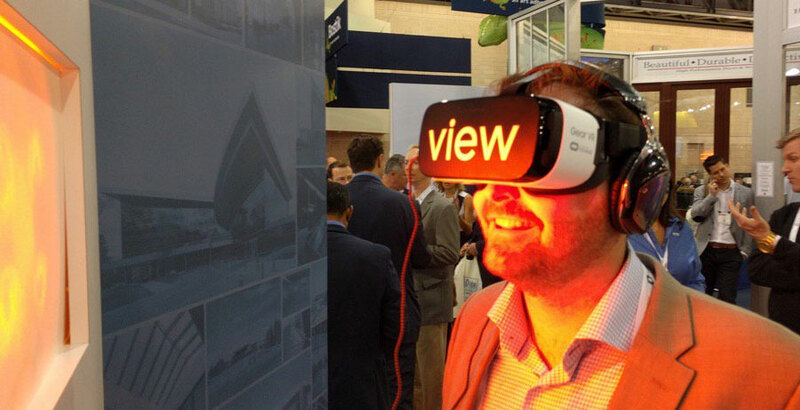 More than 90% of our sales force consider the VR kit a critical sales tool in their arsenal. – Jaime Salinas, Senior Campaign Manager, Marketing Campaigns @ View Glass. The VR experience transports participants to the CenturyLink Technology Center of Excellence facilities where View Dynamic Glass has been installed. The building incorporates 37,000 square feet of View Dynamic Glass, making this facility the single largest installation of intelligent, electrochromic glass in the country. View Dynamic Glass leverages nanotechnology and pre-programmed intelligence to tint windows and skylights automatically in response to outside conditions and user preferences, eliminating the need for blinds or shades, providing enhanced occupant experience, increasing daylighting while preserving the view, and improving energy efficiency. 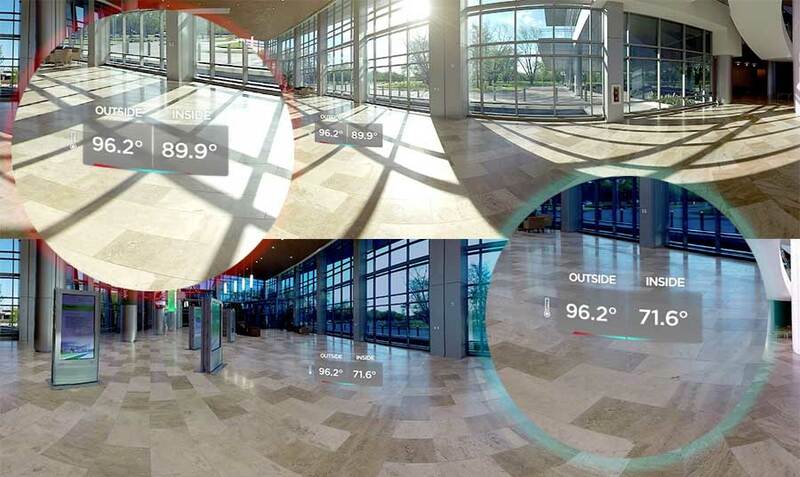 View wanted to show how their product can lower the temperature of the building from 89.9º to 71.6º by blocking the intense light and heat from the outside without blocking the view. 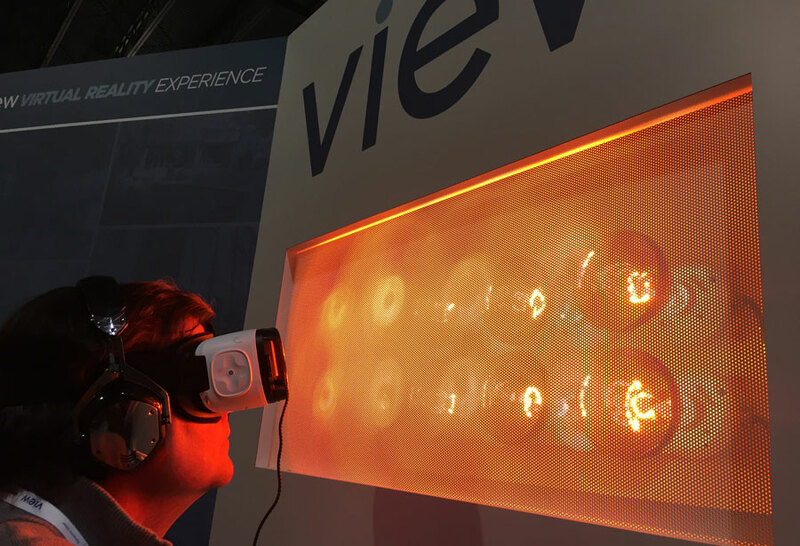 The VR Experience Needed to Demonstrate View Dynamic Glass So We Turned Up the Heat. We created a 4D effect to simulate the heat that a person feels when they are look at unprotected glass. This was done by creating an app that can turn on and off heat lamps to demonstrate the heat effect during key moments in the VR. As a person is watching the VR video, the app will turn on and off the heating effect using BlueTooth technology and a heat system connected to a Arduino system. People reacted to the heating effect saying it enhanced the experience making it more believable than anything they have done before. For more information about View Dynamic Glass visit www.viewglass.com. CenturyLink, Inc., one of the largest telecommunications companies in the United States, opened the new CenturyLink Technology Center of Excellence facilities with a technology research and development lab, a network operations center and collaborative office and meeting space.